exemptions and special rules to given companies that will benefit from the resulting complexity. 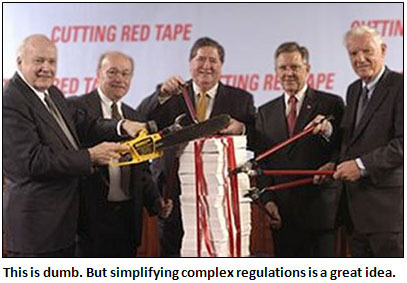 Unfortunately, Drum seems to think that this means we shouldn’t take talk about regulatory complexity seriously. No no no! It’s true that I think this problem gets demagogued too often: when you live in a big, complex society — 21st century America, for example — you’re inevitably going to have some fairly complex rules. That’s just reality, and hauling out a huge stack of agency regs in a wheelbarrow or griping about how many pages Obamacare uses up is silliness. If you think a proposed reg has unnecessary complexity, you should be able to point to the actual complexity you oppose and propose a substitute that’s simpler but still accomplishes a similar end. If all you want to do is eliminate regulations en masse, then you’re just engaged in special pleading for the interests of the business community. That said, the law shouldn’t always pander to the complexity of corporate life. If Wall Street creates financial instruments so complex and opaque that no one knows what’s inside them, that’s no reason to take seriously complaints that blunt regulations will wipe out Wall Street’s ability to do this. If a simple rule prevents things from getting too complex, that’s a double win. More broadly, de Rugy and other conservatives are right that regulatory capture is a big problem. My beef with them is that this usually becomes little more than an all-purpose excuse to insist that the corporations hardly need to be regulated at all. I take it to mean something quite different: (a) market capitalism needs effective rules to work well, and we should always try to keep those rules as simple as possible (but no simpler! ); (b) we should do our best to set up regulatory structures that are institutionally independent from the sectors they regulate; and (c) we have to accept that nothing is either perfect or permanent. Regulatory capture will always be with us, institutional independence will always erode over time, and both unceasing vigilance and periodic pruning are always going to be necessary. If you’re anything like me, right now you’re seeing the distinction that Drum is missing, and thus the real reason you sometimes find corporations loving regulatory complexity. Here’s the distinction: Some businesses are bigger than others. Some businesses can afford to hire as their lobbyists the very staffers who wrote the bill whose implementation is now being hammered out. Some businesses can afford to hire $500-an-hour lawyers to navigate the rules. Agreed! This shouldn’t be overstated, since many regulations specifically exempt small businesses. But not all of them do, and unquestionably this creates barriers that small businesses sometimes just can’t deal with. It’s a real problem, but again, conservatives too often use it as an all-purpose cudgel to oppose all regulation, and that’s where I get off the bus. However, I’d get back on if this was a real conversation about how to write sensible regulations that do what we want them to do and can be reasonably followed even by smallish businesses. Unfortunately, I think that conversation is basically nonexistent these days. Most conservatives simply don’t want to talk about it, preferring instead to mindlessly demonize all regulation using whatever criticism comes most easily to hand. Liberals of a certain stripe are more open to different regulatory approaches, but not all of them. Some are every bit as captive to big business interests as conservatives, while others are happy to throw as much sand in the gears as they can possibly get away with. There are lots of places where this creates pathological gridlock, and one of them is the intersection of environmental regs and infrastructure development. I don’t have any specific recommendations in this area, but I can’t be the only person on the left who thinks that it’s just flatly too hard to build stuff in America these days. I don’t want to cripple environmental regs, but they should be clear enough and reasonable enough that even large projects can go forward with a reasonable amount of overview and something less than Jarndyce v. Jarndyce levels of legal obstruction. If we lived in a non-insane political environment, this is the kind of thing that I think could produce a fair amount of common ground between conservatives and liberals. Liberals aren’t going to buy into libertarian notions that every regulation is a taking, but many of them are open to the idea that land use regulations are too frequently oppressive and damaging to urbanist growth agendas. Likewise, conservatives might not like intrusive and arguably ineffective business regs like Sarbanes-Oxley, but if they genuinely want to avoid bank bailouts in the future they should be open to the idea that market discipline isn’t adequate on its own, but needs to be supplemented with simple and blunt rules that truly force banks to operate in less systemically risky ways. We’re not going to reach Kumbaya land or anything, but there really ought to be ways to reach genuine compromises on some of these regulatory fronts. Unfortunately, like the economist who assumes a can opener, this assumes a non-insane political environment. It’s not at all clear if or when we’re going to have one of those again. Until then, we can only dream.